Like many audiophiles, I can trace my roots in "the hobby" back to high school, when I first had some disposable income to spend on music and audio equipment. I pored over audio magazines, and I became the guy to talk to about electronics and speakers of all kinds, mostly because I knew a salesman at the local audio store (which sold a lot more than audio) who would give generous discounts to "friends." I bought, and helped others buy, enough Pioneer, Sansui, Onkyo, BSR and Bose to stock a small store today. This is the gear I could afford, but I daydreamed about esoteric brands like Threshold, Magnepan, Conrad-Johnson, and Infinity. And Audio Research. I can distinctly remember the sensation of turning the pages of Audio magazine and stumbling over a full-page ad for a new Audio Research amp or preamp. The SP10 nearly caused respiratory distress: two chassis, both with that black-and-white scientific-instrument look that's the most recognizable in all of high-end audio. Thankfully, my adolescent asthma is a thing of the past, but I still follow what's happening at Audio Research. Doing so is my job, but it's also a matter of interest. I love the sound of tubes, and the people at Audio Research do too. Fan sites for athletes and rock bands litter the Internet, but there's also one for Audio Research, the Audio Research Database. It lists every product William Z. Johnson and his crew have created in Minnesota since the company's beginnings in 1970. I count over 50 different amplifiers and 30 different preamps. The preamps have become Audio Research's signature product. Notable examples include the SP3, which appeared in November 1972 at a list price of $595, the SP3-A1 (November 1975, $795), the SP6B (January 1980, $1495), the aforementioned SP10 (July 1982, $3500), and maybe the grand dame of all vintage Audio Research preamps, the SP11 (September 1985, $4900). 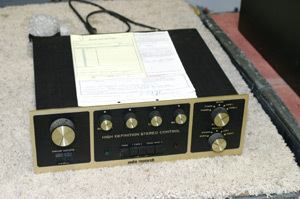 These were all full-function units whose quiet, wideband phono stages were often the reason people bought them. The phono stages are also the reason that vintage Audio Research preamps sell briskly on the used market -- that and, I suspect, the fact that others began breathing heavy at the sight of those full-page ads. Perhaps like me, today's buyers couldn't afford an SP11 when it was new, but they can now. 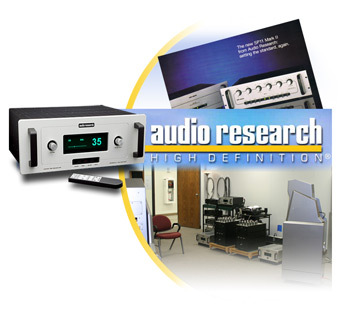 Audio Research introduced its first Reference preamp, the Reference 1, in early 1996. A remote-controlled, line-stage-only model, the Reference 1 begat the Reference 2 three years later. Because the two shared the same feature set, face plate and chassis, owners could upgrade from a Reference 1 to a Reference 2 (and eventually to a Reference 2 Mk II), which underscores Audio Research's support of its customers. Audio Research has never been content to leave its products be, sometimes to the displeasure of those who own them. But the company has supported its products like no other in high-end audio, selectively upgrading long-discontinued amps and preamps and even stocking cosmetic parts for products decades old. Having such a history requires preserving it. The same holds true for a reputation based on sonic achievement. Warren Gehl has a truly unique job. I'm sure his official title is "quality-control inspector" or some such thing, but in reality he is Audio Research's "in-house listener." In a long hallway of the company's 49,000-square-foot facility is some heavy wooden shelving on which rest row upon row of new products awaiting Warren's approval. Nothing leaves the factory without it, which means that Warren has to connect and listen to each amplifier, preamp, CD player and phono stage. This requires not only acute hearing, but good aural memory. Warren has to know what each product should sound like. If a product fails the Warren Test, off it goes to a technician, who identifies and fixes the problem. Then the product comes back to Warren. The Reference 3 ($9995 USD), which was introduced in December 2004, was something of a departure from the Reference preamps that preceded it. It is still a fully balanced, line-stage-only unit, but changes to the Reference 3's circuitry and user interface were so substantial that owners of previous Reference preamps could not upgrade. The most obvious difference is also impossible to miss, as it's right in the middle of the faceplate. The Reference 3's vacuum-fluorescent display allows for some enhanced functionality. Its numeric volume readout replaces the ring of LEDs that indicated the volume level on earlier Reference models, and it also has text indicating the input in use as well as a graphical scale for determining channel balance. One unique feature is a readout of the amount of time the Reference 3's tubes have been in service. Audio Research estimates 4000 hours of tube life, which makes the fact that the Reference 3 tracks this info invaluable. The display is big, 2 5/8"H x 6 3/4"W, and its green hue makes it easy to read even from across a well-lit room. Blue displays look nice, but they are obscured by ambient light, at least to my eyes, and red is just plain annoying. When off, the display blends nicely with a black face plate; however, it looks somewhat awkward with a silver face plate -- as though some part that fits into the void is missing -- unless the display is on. One note about this: When the display is on and the mute is engaged, the Reference 3 emits a faint high-frequency whine. This is is greatly reduced when the mute is turned off, and it goes away completely when both the mute and display are off. I've heard this same thing with other Reference 3s, so it's not unique to the review unit. I would turn the display off even without the whine -- less distraction. Six levels of dimming are also available. A 1972-vintage SP3 preamp in for updating. 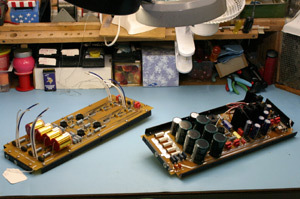 The Reference 3's audio (left) and power-supply circuit boards. Inside, the Reference 3 is utterly different from its predecessors. The Reference 1 used eight 6922 dual-triode tubes for its hybrid analog stage; its power supply was completely solid state. 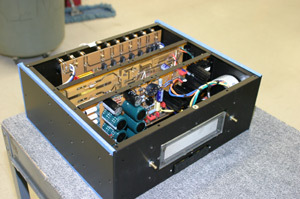 The Reference 2 used the same number of 6922s in its analog stage along with one 5AR4, one 6L6GC, and one 6922 in its all-tube power supply. The Reference 2 Mk II introduced the 6H30 triodes that the Reference 3 uses. It used six of them along with a single 6L6 and 5AR4. 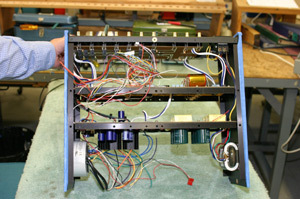 For the Reference 3, the Audio Research engineering team came up with a completely new all-tube audio circuit and hybrid power supply. There are four new circuit boards and two new transformers. Audio Research has described the Reference 3's class-A, zero-feedback audio circuit as "remarkable" and "pure and revelatory." It uses four 6H30s along with FETs as constant-current sources. The analog circuitry uses a long-tailed-pair input stage that reportedly provides the same performance for single-ended or balanced sources. The Reference 3's hybrid power supply uses single 6L6GC and 6H30P tubes and has over 50% greater energy storage than that of the Reference 2. According to Audio Research, all of this adds up to increased bandwidth (to 200kHz), reduced noise (by 12dB), and lower distortion (by 40%). With the top off, you see the circuit boards mounted vertically: the input/output relay section in the very rear, nearest the input and output jacks, the audio circuit next to that, then the power supply board, and finally the control circuitry at the very front. Gain is specified as 12dB balanced and 6dB single ended; the 6dB difference is attributable to the Reference 3's fully balanced operation. The Reference 3's front panel is clean, with only a pair of spring-loaded switches for input selection and volume, along with a row of buttons below the display and handles flanking both sides. The Reference 3 uses four microprocessor-controlled digital volume controls (one for each phase of both channels) that are graded and matched for channel balance. Audio Research chose them because of their sound quality, their very high headroom (they will accept an input of 20V balanced), and their 104 steps. The remote control and front panel don't duplicate all functions, but some thought has definitely gone into determining which ones make the most sense on the remote. Things like stereo/mono switching, absolute phase, and balance should be remote controlled, as you'll want to use them while you're sitting down and listening. The remote also allows direct access to each input, while the front-panel knob toggles through the six available. Each input can be used balanced or single ended. The most notable change around back is the use of a 20A IEC power-cord connector. As with all of its products, Audio Research includes a good-sounding power cord with the Reference 3. You may decide that you don't want to replace it. The Reference 3 is easy to use, but I do wish it saved the display status (dimmed or completely off) when you shut it down. Also, I would love for it to have the input-offset feature of the VTL TL-7.5 Reference and Mark Levinson No.32. This makes it possible to match the levels of multiple digital sources, allowing for easier comparison. Because the Reference 3's volume control has a generous number of steps, I simply equalize the output of connected source components and then count the number of steps between them. It's not as easy as switching inputs and having the preamp do the math, but it does work. In terms of functionality, the Reference 3 lies between preamps like the TL-7.5 and No.32, with their rich feature sets, and the Ayre K-1xe, which has only remote control of its volume. It is certainly closer to the Mark Levinson and VTL preamps and costs thousands of dollars less. Before I took delivery of the Reference 3, I made a trip to Audio Research to see the preamp during manufacture and to do some listening. I can't say I observed anything of note while watching a Reference 3 being assembled, but the listening turned out to be one of the sonic highlights of 2005. 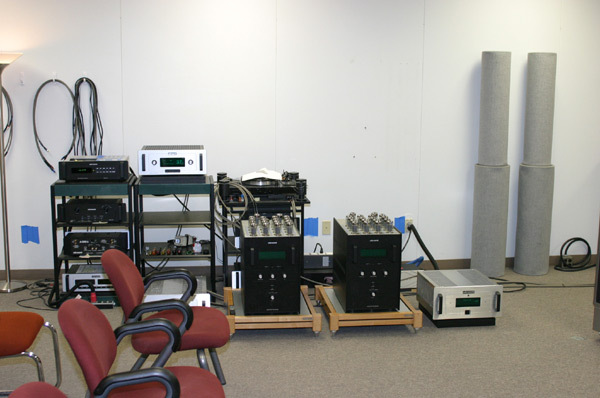 For testing purposes, Audio Research maintains two listening rooms with different systems in each. 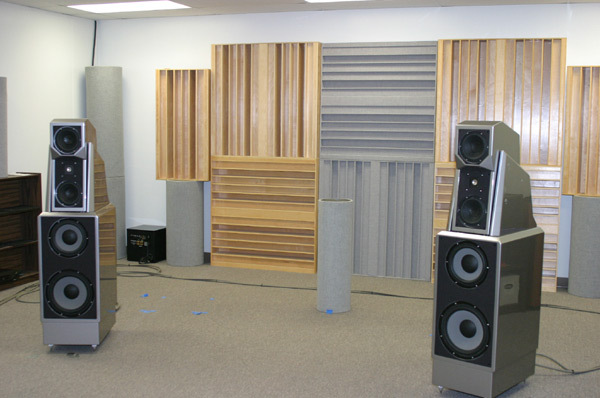 One system, fronted by Wilson Audio WATT/Puppy 7 speakers, was in the room that Warren Gehl uses for his testing. During my visit, the other larger room housed Wilson MAXX 2 speakers and a collection of Reference electronics: Reference 210 and 610T mono amps, Reference 3 preamp, and Reference CD7 CD player. I've listened to music in both rooms in the past, but the larger room has been the site of some particularly memorable demos. I wrote about this visit last fall in one of my editorials, so I won't recount it here, except to say that the way the Reference products worked together was unusual. I knew the speakers well -- I used MAXX 2s at home -- but the electronics were all new to me. Generally in situations with a number of unfamiliar products, one hears sound that's inconsistent; that is, impressive in some ways, OK in others, and disappointing in others still. Here, though, the Reference electronics worked together in such unspoiled concert that I had only questions about how Audio Research had achieved this. While it's no revelation that a trio of products from one manufacturer work well together, it's uncommon for them do so without some balancing of sonic signatures to produce a desired outcome. This is something that can be heard, even when the result is impressive. Here, however, it wasn't just that the sound was impressive; there was a sense that, from CD player to amplifier, I was listening to one integrated source-preamp-amp, not three separate products. Synergy yes, but continuity as well. As background for this review, Audio Research supplied me with some vintage literature -- they maintain a reference library of this, just as they stock parts for long-discontinued amps and preamps. In the back of Audio there were postcards for readers who wanted to request literature from the companies that advertised in each issue. They were so easy to use -- and abuse: just address, circle the numbers for what you wanted, and drop in the mail. They didn't even need a stamp! I was an abuser, and I remembered receiving some of the materials that I was now looking over. I was in high school again, but this time Audio Research had sent me more than literature.